THE BEACHBURG SUB: Who killed the train in the Ottawa Valley? These past few weeks have been frustrating for me as an Ottawa rail fan. I was twice able to leave the house early to try and catch the one weekly freight train that travels over this blog's namesake subdivision. Only to be disappointed. As I spent time waiting for the train that never came, I began to wonder, are railways in any way relevant in the Ottawa Valley anymore? And who or what killed the train in this region? As I pondered those questions this week, I surprised myself with some of the conclusions I reached. This deer was the only thing I saw on the morning of Wednesday, Sept. 16, as I waited for the Arnprior local. 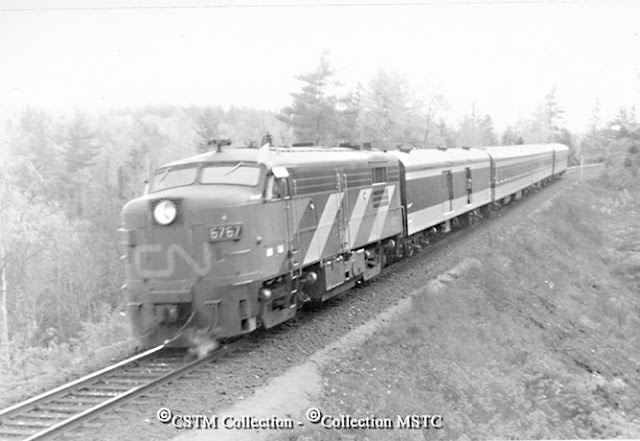 My first conclusion is that, despite everything that has happened since the 1950s, railways are still very much relevant in the Ottawa Valley, more specifically Ottawa, although the impact of the decisions in decades past are now being felt more than ever. What I mean is that trains, specifically passenger trains, could be relevant in the Valley, if the infrastructure was still in place. I won't wax on about the possibilities if the CN northern main line and CP Chalk River Sub were still in place. The reality is they are gone and for good reason. Rail lines need heavy industry trackside and other rail-friendly businesses in order to thrive. This, in turn, allows passenger lines to thrive by extension. The sad reality is globalization has killed many small-scale manufacturing businesses that were once common throughout Canada. Railways, specifically CN and CP, have become continental long-haul railways that do a good job moving imported goods from port to major centres, not to mention moving bulk commodities from their source to refineries and the market. These railways are not in business to provide local services on local spurs. So, why do I think railways are still relevant in Ottawa? Well, it's clear that Via Rail is doing quite well in Ottawa, as evidenced by the opening of its second local passenger station, Fallowfield, in 2001. More recently, major track improvements have been made in the city, including a new passing siding at Wass. Via's local schedule of trains departing for and arriving from Toronto and Montreal is impressive. This is Via's third busiest hub. That says something. Typical busy day at Ottawa's main railway station, April 2014. The distance between Montreal and Ottawa is such that driving between these cities is no big deal. But the train still thrives between these cities because it is not all that convenient to drive to either city during rush hour and it's certainly not advisable to drive in either city's downtown core without a solid game plan. This reminds me of European railways. They connect neighbouring cities where cars aren't always a feasible means of transportation. For this reason, Ottawa's passenger rail service will more than likely continue to be strong, government willing. This leaves one question in my mind: What happened to the towns in the Valley that once had a reliable rail link? This is where I think you can make several arguments, but I think it's more easily explained by a chain of events. To be clear, the loss of passenger trains in the Valley isn't as cut and dried, or as romantic, as railfans would have you believe. It's simple economics. The rail lines in the Valley became less busy for freight railways, driven by the same economic factors that have hallowed out manufacturing towns in eastern North America for decades. In CN's case, a northern main line was overly expensive to maintain, particularly through stretches like Algonquin Park. 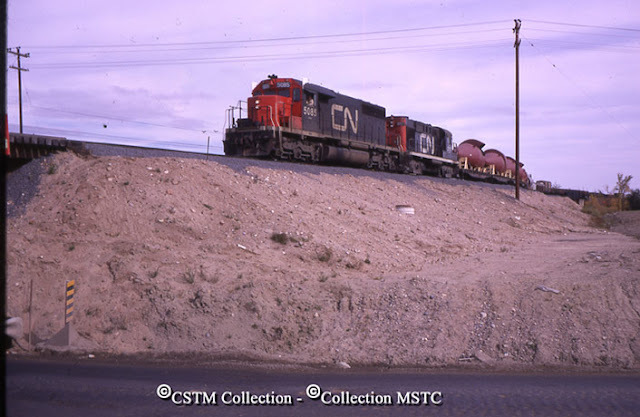 A CN freight train passes over a shoo-fly track near Moodie Drive in 1973. This rail line now hosts one round-trip per week (Canada Science and Technology Museum). Once the freight railways lost business on lines like the Beachburg and Chalk River subs, passenger rail was in trouble. There were two reasons why these passenger trains have disappeared. The first reason is simple: passenger trains travel over CN and CP tracks at the whim of these freight railways. Once a line is redundant to a freight railway, Via's chances of keeping that route are slim. Ask those who fought to have that rail line in New Brunswick retained for Via's service there (happily, the line was retained, but not without lots of drama). More close to home, the Canadian travelled on CP's Carleton Place Sub only until CP decided it wasn't worth keeping that line around. The second reason passenger trains have disappeared are closely tied to the first. When business dries up in these small towns, the very nature of these towns change. Unless these towns manage to reinvent themselves as tourist hotspots or in some other way, their economy suffers. The demand for rail travel diminishes as there are fewer reasons to go to these towns by train. We can't overlook the obvious fact that passenger rail in small towns has also been affected by the development of bigger, better, safer highways, even in fairly remote areas in the upper Ottawa Valley. This was a continental trend, which has resulted in a number of problems in American cities where freeways have destroyed neighbourhoods and segmented cities. But for towns in the Valley, highway construction has become the main form of local transportation. Finally, deregulation made it much easier for CN and CP to dispose of rail lines that were not profitable, including the Beachburg, Chalk River, Ellwood, Prescott and Lachute subdivisions, all lines that were once prominent in the region. Of course, this factor is not unique to Ottawa. Rail fans in every corner of the country can point to a line close to home that has since been abandoned. The complicating factor for rail fans is that the Canadian government does not have strong legislation that prevents railways from ripping up track when there is a compelling local case to be made for retaining those rails. For example, if the city wanted to save Beachburg for whatever reason but could not immediately afford the asking price, there would be little to stop CN from ripping up the track. The situation in the United States seems much easier for local groups who are interested in retaining rail lines. All these factors have combined to make stops like Carleton Place, Almonte, Perth, Arnprior, Pembroke, Petawawa but a memory. The question that I often have when I think of these old train stops is what do people do for a living in some of these more remote towns (Petawawa being the exception, everybody knows it's a military town)? The businesses close, the rails disappear but these towns persist. What keeps these towns alive? Some exist as bedroom communities for people who commute to Ottawa, but the others struggle. It's a question that I cannot answer. We cannot discount how much of an impact the Greber Plan has had in driving railways out of Ottawa. The plan, for those who might not know, was devised by what is now the National Capital Commission in the 1950s. The plan called for the removal of most railway lines from the central part of Ottawa. Most of those lines were removed in the late 1960s, including the main passenger line to Ottawa's former Union Station downtown. The beautification scheme mostly made sense, since there were too many rail lines in Ottawa, including a large rail yard where much of the University of Ottawa's more modern campus now sits. It makes no sense to have such a large railway presence and related industries so close to the Parliamentary precinct. But, I truly believe anyone who is fair minded would agree that the plan went too far. Having a passenger rail link in Ottawa's downtown core makes more sense today than ever. Via still does quite well in this city. The value a railway brings to a city like Ottawa very much depends on its ability to deliver passengers to the downtown core. Railways understood this 100 years ago and Via understands this today. If you have to drive out to an airport on the edge of town, pay a king's ransom for parking or cab fare, arrive hours early to clear security and check your baggage and wait for your plane to take off after it taxis behind a string of other planes, you will begin to consider the train as a viable form of transportation. Ottawa's main station is perched in no man's land, beside the Queensway, without an efficient link to the highway. On the station's back side is a massive big box store development (former railway land); on another side, a busy four lane divided arterial road; on another side a cluster of small-scale office buildings and shops. Just beyond that small industrial area is a small subdivision with streets named after the letters of the alphabet. You get the idea. Imagine if the city still had use of its Union Station downtown. Granted, it would infringe on parkland near the canal, but I have never understood how having a busy parkway on either side of the canal makes any more sense than having a single railway track. As an example of a city where this arrangement works, allow me to submit for your consideration, Quebec City. Quebec City's Via Rail Terminal in August 2010. This station, much like Ottawa's old Union Station, is an architectural marvel very close to old Quebec. 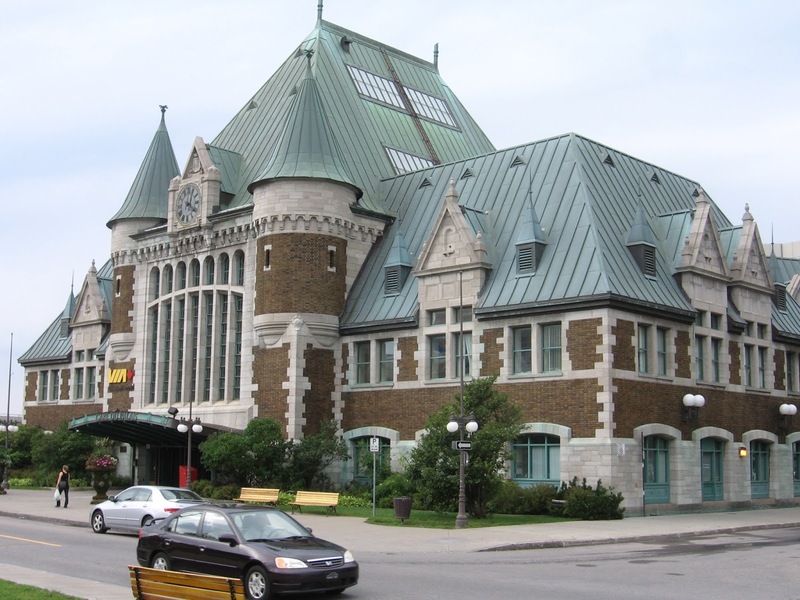 I would imagine if Ottawa had retained a rail connection along the lines of the one in Quebec, residents would come to appreciate having such a connection in the heart of their city. But the car-crazy 1960s beautification scheme that transformed Ottawa will never permit this to happen. And make no mistake, the Greber Plan was very much geared toward creating major car thoroughfares. Anyone who sees the truck traffic on Rideau Street or the patchwork quilt of roads and abandoned stores behind the Rideau Centre mall in the downtown can thank the Greber Plan in part for this mess. Also, the existence of the Queensway and the Vanier Parkway are both largely thanks to the use of railway lands and tracks for roads. In many respects, these thoroughfares are a product of a time when highways were seen as a showpiece of a modern city. Just look at some of the original renderings of the Queensway and you will see the vision, however flawed, that planners had at the time. The city did do one very smart thing with old railway tracks when it created the bus-only Transitway. This rapid bus road crosses much of the city with very minimal stoppages, allowing commuters a convenient option for getting to and from work. The system has flaws, of course, like the bottleneck of buses in the old city core, where the Transitway makes use of downtown arterial streets, but on the whole, it's an excellent system. When I heard that politicians wanted a light rail system and wanted to operate it through downtown with a tunnel, I scratched my head and wondered why the same consideration wasn't given to buses. After all, the city already has much of the Transitway infrastructure in place and buses offer more flexibility than trains for commuters. No matter what your view of the new light rail system, you can't deny that using old railway lines for a bus road was a silver lining to the worst elements of the Greber Plan. So, for those keeping track, those are all the elements that I believe led us to where we're at today. Economic forces have caused a great deal of industry to leave the Ottawa Valley, which includes pulp and paper, manufacturing and other commodities that freight railways used to rely on for revenue. Once those businesses closed, the freight railways scaled back their operations and eventually abandoned their rights-of-way. That in turn has killed passenger rail along those rail lines. Those economic factors combined with an anti-rail development plan in Ottawa, which further reduced the rail network's prominence in the region. Deregulation further eroded the national railway presence in the Valley. 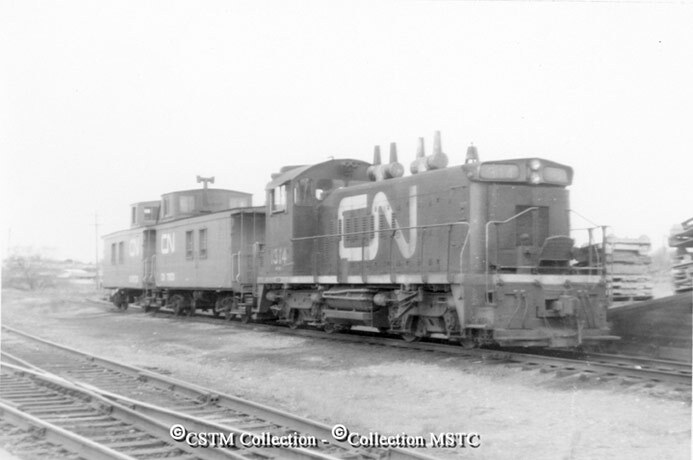 The more recent developments include CN taking over for former shortline Ottawa Central and subsequently tearing up much of the remaining Beachburg Subdivision between Pembroke and Nepean Junction. That moves leaves several remaining industries along that former line and the shortened Renfrew Spur (wood pellet plant in Portage-du-Fort, aerospace manufacturing facility in Arnprior and other businesses without rail service) with no other option than to use trucks. Despite efforts to re-establish rail service on the old Beachburg line, the rails are gone and the last remaining rails in the Valley are now only a memory. Switcher and two old cabooses in Pembroke, 1973. That rails in this Ottawa Valley community are now gone. All this leaves the question in my mind, what's next for railways in Ottawa? I think there is reason for faint hope and here's why. The first reason there could be hope is that Ottawa is busy re-establishing rails for a 2018 launch of its electrified commuter rail service. While this won't have any impact on the Valley's rail network on a larger basis, it will at least bring railways back into prominence in the city. There was some talk years ago of freight railways using the city's LRT line for freight operations outside the hours of O-Train operation. I don't see this happening anytime soon, but it at least raises the possibility that it could happen, if there was a willing partner. I think it's highly probable that a shortline operator could return to Ottawa in the future, if there is a business case to be made. Currently, I don't think there's enough carloads or traffic to entice a shortline operator along the lines of the Ottawa Central. But I think that if the CN was given a chance to leave Ottawa, it would leave in an instant for the right price. It's fairly common knowledge that CN had very little interest in returning to this city when it was given control of the OCR as part of a package of railway operations it purchased in 2008. It seems to me that Ottawa would be a natural fit as an intermodal hub, since our city is the largest urban centre this far north and could potentially act as a gateway hub for cities further north. American railways have followed this model, but CP and CN seem content to funnel their container trains to the major centres exclusively. Perhaps Ottawa is too close to Montreal for any container train facilities. But it seems like a good spot for a regional container offloading spot where trains offload container trains and trucks take them to cities throughout the Valley and into Northern Ontario. Finally, if there was ever the political will to do so, I think Ottawa would be an integral part of a high-speed rail corridor. We seem to have lost our interest in nation building exercises, which include high-speed rail links. Thinking of the last attempt at a project of this scale, one might be able to make a case for the Trans-Canada Highway as the most recent example. I am encouraged that other countries have pursued high-speed rail with some success. Heck, if the United States can do it in California (so far anyway), then surely it's not out of the question for Canada to pursue this. But that would require the political will, which is the tricky part. A few backers have suggested that Ottawa and its surrounding municipalities could benefit from a GO Transit model that would deliver commuters to Ottawa via commuter trains, but the appetite for that type of system has not attracted any political backers, sadly. Unfortunately, Ottawa has been spoiled by half a century of not really having to live alongside an active rail network. Most people in the city have very little idea of just how much potential Ottawa's rail network holds. The current LRT love-in among city politicians notwithstanding, there is very little understanding of railways in Ottawa. So, that's my take on what's happened to the rails in the Valley and what might be ahead for this form of transportation. To answer the question I first posed in the title, no single factor or person killed rail in the Ottawa Valley, but I think a number of bad decisions need to be rectified if there is to be any realistic future for this mode of transportation here. Beyond my self interest as a rail fan, the benefits of a healthy rail system to any major city are obvious, even beyond the benefits for inter-city passenger rail. Anyone who sees the truck traffic on Highway 401 or Highways 416 and 417 can attest to the stress this puts on the highways. I'm not saying that trains would ever overtake trucks for short-haul cargo traffic, but I do think a healthy rail corridor could have prevented the flood of trucks we now see on highways here. And to close the loop on my anecdote, I decided to head back out in the afternoon to catch the Arnprior local returning from Nylene Canada and finally had some success. This picture below, in the context of this post, represents what is left in the western Ottawa Valley. This train is all that is left of railways in an area that was once very much defined by railways. More on this meet in a future post. As for catching 589, I think that it is leaving later in the mornings. I heard it on its return trip around 5:30pm today. Michael, excellent post as always! I've been following your blog for some time now. I too was able to catch 589 on September 30, more on that in a moment! There truly was no single event that caused any of the abandonment that has occurred over the years. Living up in Deep River, I have witnessed the removal of the Chalk River and North Bay subs up to Mattawa. It is a minimum hour drive East or West to have even a remote chance of seeing a train, but these days I always go prepared with my scanner and camera. I grew up in Corbeil, a small town just outside of North Bay and my parent's house is less than a kilometer from a bush trail crossing of CP's North Bay Sub. As a kid, those trains rolled by 3, 4, 5 times a day and we never thought twice about it. We are lucky that Ottawa Valley Railway continues to operate this line through Mattawa and out to Tembec via the Temiscaming Sub, but it is a small fraction of what used to travel those rails. With scanner and cameras in hand, my daughters and I take every opportunity we can to catch that train at the end of Grandma and Grandpa's road because some day it may be gone too. Thanks to having the FRED frequencies programmed in my scanner, I heard a little chirp as I was nearing Arnprior on the highway so I knew it was not far away. I turned off at the first entrance to Arnprior and headed back Eastward on the old highway. Through the fields, I saw 4771 and its two tankers! I will admit, there was a verbal "YES!!!" said aloud to myself in the car as I headed for Galetta Side Road. I first setup to capture it crossing the Mississippi River bridge, then followed it to a few other nearby crossings between Galetta Side Road and Kinburn before turning around and getting back on the highway. I'm working on a video compilation, I'll send you the YouTube link when it is done. Lastly, what I find most interesting about the one picture you shared, is the crew ran the engine around the tankers at some point after I left them... I look forward to your post on your encounter with 589! Thanks for the feedback and congrats on snagging 589. I would have said the cards were stacked against you but you managed to beat the house anyway! The shot I included in the bottom of the post was actually taken Sept. 16, so that explains the slightly different consist. Please do feel free to share any links you may have as I am sure the readers (and I) would love to see your footage and shots. Thanks Mike, I knew the odds were against me but that is what rail fanning is all about, right? Here is the YouTube link to my encounter with 589. I'll apologize for the wind noise in advance! Totally off topic, but I happened by a surprise at the VIA station on Tremblay Road today. Seems there are 3 RDC's there. Not sure why, but easy to walk around and look at as they're parked right beside the parking lot on the east side of the building. Interesting, Keith. I'm not sure why RDCs would be up here. I've seen some one-off trains parked on the track you're speaking of, but never RDCs. Just came across your article by accident ... very informative. Congratulations on a great site ! This is completely off-topic but I was up in Dunrobin/Constance Bay/Fitzroy Harbour last evening and came across several examples of what could have been old rights-of-way. Might you have any information about the railway history of this particular area of the Upper Ottawa Valley (i.e. lines/stations) ?